Professor Dr. Noori Y. Salman University of Kufa Faculty of pharmacy Dept. of pharmaceutis &drug industries. Najaf Governate. Iraq Date of birth: Najaf 1958 Tel: +964(0)7814949045 Email:[email protected] M. Sc and ph.D from HullUniversity and University of Surrey (United Kingdom) in Kinetics Reactions and Catalysis. Demonstrate at the University of Baghdad 1980, lecturer 1988University of Baghdad, Assist. 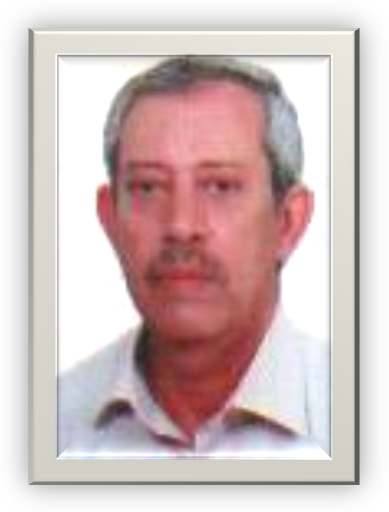 professor 1993University of Baghdad, and associate professor 2006Lybia. Professor 2013 Patents Holder on 1- Asphaltine as adsorbent for carcinogenic pollution 2- Palm roots as adsorbent for carcinogenic pollution Supervision: 22 students M. Sc and 1 student ph.D Research interest: 1- Bio-physical studies of some enzyme 2- Kinetics studies of the terminated reactions 3- Kinetics studies of the complexes reactions 4- Adsorption studies for treatment of factory waters Teaching interests: 1-Kinetics of reactions 2-Catalysis 3-Thermodynamic 4-photochemistry Selected Publication: 1- Noori Y. Salman, Oxidation of some primary alcohols by N-bromoacetamide in acid medium using chloro complex of Rh(III) as catalyst. J. of Kufa for chemical Science No. 9 p. 60, (2014). 2-Kinetics and mechanism of oxidation of alanine by cerium (IV) in presence of silver to be published in J. of Qadesi for pure science (2013 3-Noori Y. Salman, Kinetics and mechanism of oxidation of alanine by cerium(IV) in presence of silver (1). Journal of Al-Qadisiya, for pure sciences, 2012 4-NooriY.Salmanand Salem Et. Ashoor, kinetic, electronic properties and conductivity study of ((12Z)N-(57)-1-bromo-5-phenylimino-IH-pyrool-2-(5H)- ylidenebenzenmine. Journal of chemistry and chemical engineering ISSN 1934-7375, USA, Vol. 3, No. 10, (2009). 5-NooriY.Salman and Abid b. Al-Quel, Spectroscopic study and calculation of energies of vibrational, rotational, and translational for Butanone, Zuletin Journal for pure and applied science, vol. 9, No. 7, p.23, (2008). 6-NooriY.Salman and Abid b. Al-Quel, Spectroscopic study and calculation of energies of vibrational, rotational, and translational for Bentanone, Zuletin Journal for pure and applied science, vol. 9, No. 7, p56, (2008). 7-NooriY.Salman, Alsedeq A. Obeid ans A. M. El-soll, Synthesis of some new heterocyclic compounds from 3-Aroylprop-2-enoic, Subha Journal for pure and applied science, (2007). 8- Noori Y. Salman, Kisma H. Al-Niami, and F. M. Ashoor, Adsorption study of Aldehydes compounds on surface of charcoal retum from their equoes solution, Zuletin Journal for pure and applied science vol. 8, No. 7, p. 42, (2006). 9-Noori Y. Salman, M. M. Humoda and, Alsedeq A. Obeid , Adsorption studies of phenolic compounds on surface of Gasol charcoal from their equoes solution, National center for studies and research of technology and science, (2005). 10- Patent,Noori Y. Salman, J. A. MauofandAlsedeq A. Obeid, Palm leaves origin) as adsorbent for carcinogenic pollution, patent No. (311/2002) Libya. 11- Noori Y. Salman, M. S. Al-amiry, and S. A. Eusa,, study of ability ofKaolineGlay for adsorption phenolic compounds from their equoes solution, vol. 27A, No. 1, (2001). 12- Noori Y. Salman, M. S. Al-amiry, and S. A. Eusa,, study of ability ofbentoniteGlay for adsorption phenolic compounds from their equoes solution, vol. 41A, No. 4, (2000). 13- Noori Y. Salman , Kisma H. Al-Niami, and T. I. Al-Bajjar, A study of window diagram procedure to optimize the separation of some phenols by gas-liquid chromatography, Ibn Al-haitham Journal for pure and applied science, (2000). 14- Noori Y. Salman, and Kisma H. Al-Niami, Kinetics of oxidation of Oxalic and Malonic acids N- chloro-succiniamide in alkaline medium, Iraqi Journal of sci. vol. 41A, No. 4, p170(2000). 15- Noori Y. Salman, and Kisam H. Al-Niami, Kinetics and mechanism of oxidation of ethylene di amine tetra acetic acid (EDTA) by bromoamine-T in buffer medium, Ibn Al-haitham Journal for pure and applied science, (2000). 16- Noori Y. Salman, Kinetics of oxidation of threonine by N- iodo-succiniamide, Ibn Al-haitham Journal for pure and applied science, vol. (11), No. 2, p58, (1999). 17-Noori Y. Salman, and Kisma H. Al-Niami, Kinetics of oxidation of threonine by N- bromo-succiniamide, Ibn Al-haitham Journal for pure and applied science, vol. (10), No. 2, p75, (1999). 18-Patent,Noori Y. Salman, A. A. Adam, and A. H. Al-dujili, Using Asphaltine as adsorbent for phenolic and acetophenone from their aqueous solution, Patent No. 2700/1998 Iraq. 19-Noori Y. Salman, I. D. Al-tikriti and S. S. Al-ani,Kinetics of oxidation of leucine by N- bromo-succiniamide, Ibn Al-haitham Journal for pure and applied science, vol. 8, No. 2, (1997). 20-Noori Y. Salman, and Kisam H. Al-Niami, Kinetics of oxidation of threonine by N- bromo-succiniamide, Ibn Al-haitham Journal for pure and applied science, vol. (8), No. 1, (1997). الأستاذ الدكتور نوري يوسف سلمان العنكوشي جامعة الكوفــــــــــة كلية الصيدلة قسم الصيدلانيات والصناعية الدوائية محافظة النجف الاشرف العراق خلوي +964(0)78014949045 البريد الالكتروني [email protected] حاصل على شهادتي الماجستير والدكتوراه من جامعة هل وجامعة سري في المملكة المتحدة /بريطانيا في اختصاص دراسة حركيات التفاعلات والتحفيز. معيد في جامعة بغداد 1980، دكتور مدرس 1988 جامعة بغداد ، دكتور استاذمساعد1993جامعة بغداد ، واستاذ مشارك 2006 ليبيا, استاذ 2013 حاصل على برائتي اختراع -	استخدام الاسفلتين كمادة مازة لازالة الملوثات المسرطنة -	استخدام جريد النخل كمادة مازة لازالة الملوثات المسرطنة الاشراف على الدراسات العليا : اشرفت على 22 طالب ماجستير و1 طالب دكتوراه الاهتمامات البحثية دراسات حيوية-فيزيائية لبعض الانزيمات دراسات حركية للتفاعلات المنتهية دراسات حركية للتفاعلات المعقدة دراسات الامتزاز في معالجة مياه المصانع q M. Sc and ph.D from Hull University and University of Surrey (United Kingdom) in Kinetics Reactions and Cata lysis. Demonstrate at the University of Baghdad 1980, lecturer 1988 University of Baghdad, Assist. professor 1993 University of Baghdad, and associate professor 2006 Lybia Professor 2013. Patents Holder on 1- Asphaltine as adsorbent for carcinogenic pollution 2- Palm roots as adsorbent for carcinogenic pollution Supervision: 24 students M. Sc and 1 student ph.D Research interest: 1- Bio-physical studies of some enzyme 2- Kinetics studies of the terminated reactions 3- Kinetics studies of the complexes reactions 4- Adsorption studies for treatment of factory waters Teaching interests: 1-Kinetics of reactions 2-Catalysis 3-Thermodynamic 4-photochemistry Selected Publication: 1-Noori Y. Salman, Kinetics and mechanism of oxidation of alanine by cerium(IV) in presence of silver (1). Journal of Al-Qadisiya, for pure sciences, 2012 2- Noori Y.Salman and Salem Et. Ashoor, kinetic, electronic properties and conductivity study of ((12Z)N-(57)-1-bromo-5-phenylimino-IH-pyrool-2-(5H)- ylidene benzenmine. Journal of chemistry and chemical engineering ISSN 1934-7375, USA, Vol. 3, No. 10, (2009). 3- Noori Y.Salman and Abid b. Al-Quel, Spectroscopic study and calculation of energies of vibrational, rotational, and translational for Butanone, Zuletin Journal for pure and applied science, vol. 9, No. 7, p.23, (2008). 4- Noori Y.Salman and Abid b. Al-Quel, Spectroscopic study and calculation of energies of vibrational, rotational, and translational for Bentanone, Zuletin Journal for pure and applied science, vol. 9, No. 7, p56, (2008). 5- Noori Y.Salman, Alsedeq A. Obeid ans A. M. El-soll, Synthesis of some new heterocyclic compounds from 3-Aroylprop-2-enoic, Subha Journal for pure and applied science, (2007). 6- Noori Y. Salman, Kisma H. Al-Niami, and F. M. Ashoor, Adsorption study of Aldehydes compounds on surface of charcoal retum from their equoes solution, Zuletin Journal for pure and applied science vol. 8, No. 7, p. 42, (2006). 7- Noori Y. Salman, M. M. Humoda and, Alsedeq A. Obeid , Adsorption studies of phenolic compounds on surface of Gasol charcoal from their equoes solution, National center for studies and research of technology and science, (2005). 8- Patent, Noori Y. Salman, J. A. Mauof and Alsedeq A. Obeid, Palm leaves origin) as adsorbent for carcinogenic pollution, patent No. (311/2002) Libya. 9- Noori Y. Salman, M. S. Al-amiry, and S. A. Eusa, , study of ability of Kaoline Glay for adsorption phenolic compounds from their equoes solution, vol. 27A, No. 1, (2001). 10- Noori Y. Salman, M. S. Al-amiry, and S. A. Eusa, , study of ability of bentonite Glay for adsorption phenolic compounds from their equoes solution, vol. 41A, No. 4, (2000). 11- Noori Y. Salman , Kisma H. Al-Niami, and T. I. Al-Bajjar, A study of window diagram procedure to optimize the separation of some phenols by gas-liquid chromatography, Ibn Al-haitham Journal for pure and applied science, (2000). 12- Noori Y. Salman, and Kisma H. Al-Niami, Kinetics of oxidation of Oxalic and Malonic acids N- chloro-succiniamide in alkaline medium, Iraqi Journal of sci. vol. 41A, No. 4, p170(2000). 13- Noori Y. Salman, and Kisam H. Al-Niami, Kinetics and mechanism of oxidation of ethylene di amine tetra acetic acid (EDTA) by bromoamine-T in buffer medium, Ibn Al-haitham Journal for pure and applied science, (2000). 14- Noori Y. Salman, Kinetics of oxidation of threonine by N- iodo-succiniamide, Ibn Al-haitham Journal for pure and applied science, vol. (11), No. 2, p58, (1999). 15- Noori Y. Salman, and Kisma H. Al-Niami, Kinetics of oxidation of threonine by N- bromo-succiniamide, Ibn Al-haitham Journal for pure and applied science, vol. (10), No. 2, p75, (1999). 16- Patent, Noori Y. Salman, A. A. Adam, and A. H. Al-dujili, Using Asphaltine as adsorbent for phenolic and acetophenone from their aqueous solution, Patent No. 2700/1998 Iraq. 17-Noori Y. Salman, I. D. Al-tikriti and S. S. Al-ani, Kinetics of oxidation of leucine by N- bromo-succiniamide, Ibn Al-haitham Journal for pure and applied science, vol. 8, No. 2, (1997). 18- Noori Y. Salman, and Kisam H. Al-Niami, Kinetics of oxidation of threonine by N- bromo-succiniamide, Ibn Al-haitham Journal for pure and applied science, vol. (8), No. 1, (1997).